Reviewing games you have a history with is always difficult, especially when they’re derivative titles from a series you hold dear to your heart. Looking back on it, at some point I’ve owned each of the eight Burnout games that make up the franchise going back to the original that was released all the way back in 2001. If you’ve never played a proper Burnout game (which is a problem you really should look into solving) here’s what the series is all about- Imagine a high-octane arcade racer that not only has a fabulous sense of speed, but takes the typical car damage system dozens of steps further into a car crashing system. Instead of merely beating the competition to the finish line, gameplay focuses on making sure your your opponents never actually make it there. Subsequent sequels took this many steps further, even evolving into entire game modes that focused entirely on orchestrating the most elaborate pile-ups you can. It’s from these game modes that Burnout Crash ($4.99) is distilled from, making its original appearance on Xbox Live Arcade and PSN late last year. In Crash, the familiar racing game camera angle is replaced with an overhead birds-eye view of your car. 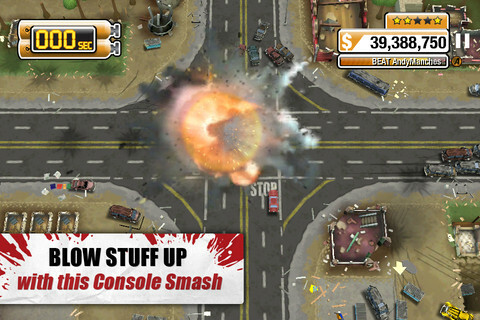 The game consists of a series of intersections, each with slightly different layouts and traffic patterns, and you need to unleash as much damage as possible. Initially, you drive in, and slam into some cars. Cause enough damage, and you’ll be able to explode again, and vaguely control where your car gets blasted to in the process. This continues until you’ve either let five cars escape off screen, or you’ve reached the damage threshold for the level. Burnout Crash perfectly embodies the horrid cliche of “Easy to learn, but difficult to master." It’ll only take you a few tries to get a handle on the game physics, but actually learning the nuances of where to try to stack up cars on each intersection and how to position your own car to not mess up existing piles almost turns Crash an entirely unexpected physics puzzle game, especially if you jump into it expecting something like previous Burnout titles. 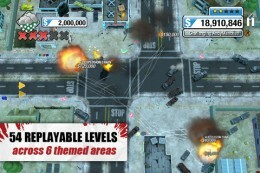 Gameplay is further spiced up by special cars that appear such as a wave of police cars that block part of the intersection to the insufferably terrible driver Dr. Beat who will restore one of your missed cars if he survives his drive on and off screen. (However, as Penny Arcade points out, he’ll crash into anything.) Additional game modes also add a decent amount of replay value. My first experience with Burnout Crash was on Xbox Live Arcade, as a $15 title. Like most Burnout games, the overall energy of the game was amplified by a real soundtrack, heavy amounts of voice work, and a fabulous tutorial, creating an absolutely fantastic first impression. Those last two things? Nowhere to be found in the iOS port of the game. I could understand cutting a lot of the voice overs if EA was shooting for the 3G download limit, but the game weighs in at 146MB currently. The lack of any kind of tutorial is even more puzzling, and has left players in our forums confused as to what you’re even supposed to do in the game. That’s not what has me personally disappointed the most though, as I already know how to play and usually play iOS games with the sound very low or off so voiceovers don’t do much for me. 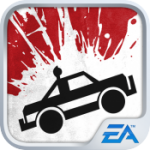 What I’m bummed about is that for whatever reason, EA thought the best (and only) way to control the game was via a weird system of swiping gestures to move your car around after each crash breaker explosion. If you can “see the Matrix" behind Burnout Crash, it’s apparent that what you’re playing is a very elaborate and cleverly disguised ball-rolling game. Imagine something like Labyrinth 2 ($4.99), except instead of freely rolling the ball you can only move when a crash breaker triggers, and instead of trying to make it to the end, you’re trying to roll into as much as you can. It’s because of this that tilt controls, even when playing on the Xbox 360, felt like they’d make the most sense- as they often do in top-down games. On the technical side of things, given just how long EA has been working on the iOS port of Burnout Crash, there’s some odd flaws. While I’m thankful the game is universal, some of the textures in game are blatantly low-resolution on the new iPad. I’ve experienced Game Center weirdness, with popups often telling me that the game is not recognized by Game Center. Additionally, most intersections start with some noticeable frame rate drops as you race towards them. Also, the little springy “boing" sound that plays each time you swipe the screen really needs to go. Admittedly, I’m probably being overly nitpicky because of my experience with this game. However, the things Crash feels like it’s missing don’t make a whole lot of sense, especially when it comes to the game’s tutorial. Regardless, I’m still going to play through Crash over and over again on my iPad, with my fingers crossed that EA eventually addresses some of these things. And even if they don’t, if you’ve never played the console version, I’m not even sure you’ll care or notice.